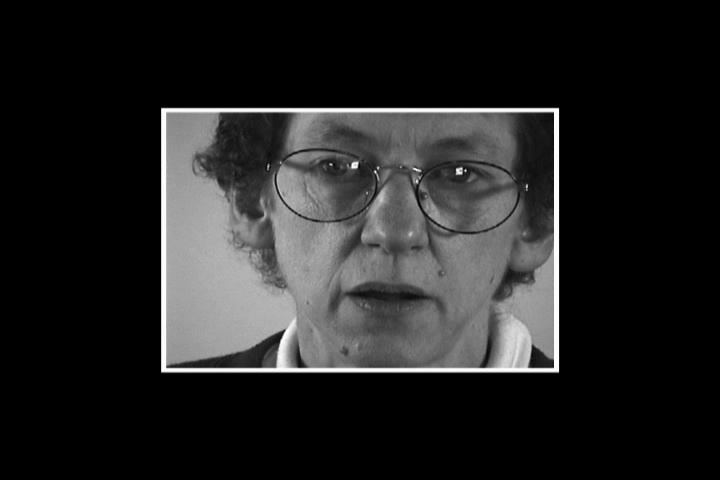 In the late 1990s I set up a video monitor and camera and asked my Mother and Father to tell their life stories. The idea was for them to talk to themselves in a video monitor, without me present, and thus keeping their image in the camera view. My Dad went first, and after about 2 hours, my Mother took her turn for another 3 hours over 2 days. On the second day, when finished, my Mom got up from her chair leaving the camera running. Years later, in 2004, I was asked to do a sound and video installation in 19th Century, abondoned, western jail in Basin, Montana, and decided to look back through my archive of video for something useful. It had been 6 years since I'd made the above recordings and, not only had I not looked at the footage, the tapes had never even been rewound. As I reversed the second tape, stopping it now and then to find the end of my Mother's segment, I found that Shaaron Wood, a foster sister of mine and caretaker for my parents in old age, had plunked down in front of the live camera where my Mother had been sittng and started to talk. As I watched and listened to the video (at first she has the microphone a mile from her mouth accounting for the poor fidelity for half of the piece), I was astonished at what she was saying. Here was an uninvited testimonial of a woman who is at times is, perhaps, dilusional and yet, and even moreso, powerfully honest and touching and it struck an emotion in me. I am not certain if what Shaaron says in the video is true. I suspect so but decided in the credits to list her as an actor-improvisor. The piece is somewhat exploitative, for sure, except Shaaron liked the work and in my opinion comes off with a degree of nobility. Playing it in a jail at a festival which attracts and is run by strong woman gave it an edge. The romantic and fragmented sound accompaniment for this video is taken from a cassette produced in the late 1980s where only entrance phrases and sung tones are used. The video frame here is reduced to a small black and white box, as if Shaaron is talking though an opening in a closed door in another time. Since the initial jail installation, I have played the piece in numerous concert situations.